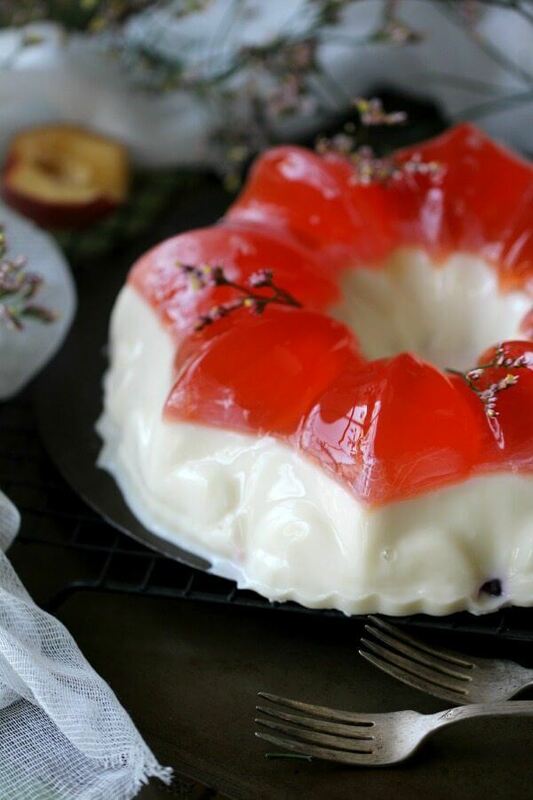 Jelly Cake is gorgeous and easy to make with fresh summer flavors and a creamy condensed milk. I love making colorful and easy cakes, like my popular Clementine Mousse Cake and Mango Mousse Cake. Jelly Bundt Cake is refreshing, puffy and simply delicious. For this cake, I went with summer flavors, such as peach and raspberry. I added some creamy and sweet layer of condensed milk jelly, which resulted in a delicious and perfect cake. It was my first time trying to make condensed milk jelly, but fortunately it turned out fabulous. 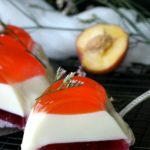 This Jelly Cake tastes a little like flan and creme brulle, except it has a different texture and so much easier to make. For a more festive look I used a bundt cake pan, and the cake turned out very sophisticated and fancy. Look at those amazing layers of creamy goodness, its so nice to have the creamy condensed milk layer, it makes this concoction feel like a real cake, it ties together and balances the fruit flavors. By segregating the peach and raspberry layer, you truly get to experience their individual flavors and aromas. Perfect for special events or occasions, like Valentine’s Day, or Flag Day. Can be made with variation of colors. Do you need gelatin for this jelly cake? Since this is a jelly cake, you most definitely need gelatin. If you want to substitute the gelatin, you can use agar agar, and it should be handled in the same way. How Long Will Bundt Jelly Cake Stay Fresh? The cake can be stored wrapped in plastic wrap at room temperature for about 3-4 days. CAN YOU FREEZE Bundt Jelly Cake? Freezing is possible for up to 2 months. Since the jelly cake contains gelatin and some sugar it will not freeze completely solid. 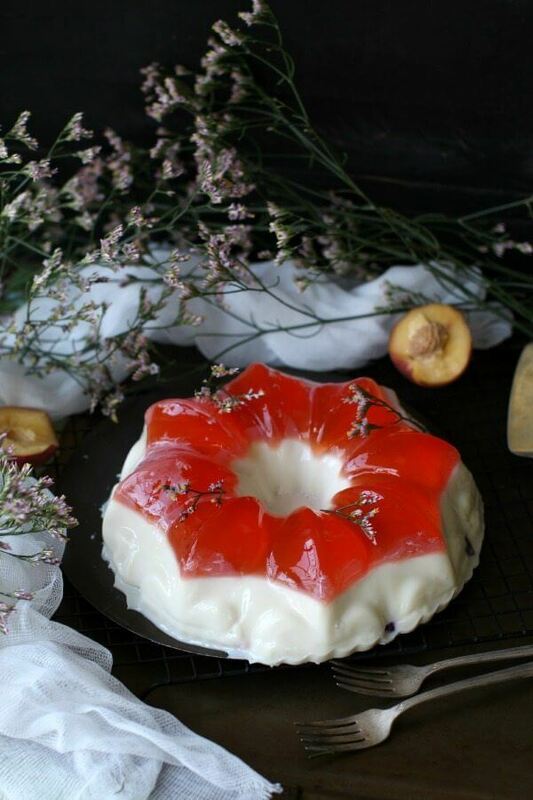 To thaw the jelly cake, overnight in the fridge and consume within 24 hours. You may also be able to serve the cake almost frozen, as an iced fruit jelly. Spray a bundt cake pan with cooking spray and set aside. First start with the Peach layer, follow instructions on the package as they may differ based on the brand you use. Usually you just have to mix the package mixture with cold water. Once done, pour it into the bundt pan layer and set in the fridge until jelly is set, 20-30min. In a bowl pour one cup of cold water and add in 4 envelopes of plain gelatin, stir to dissolve. Pour sweetened condensed milk into a medium-sized mixing bowl. Add 2 cups of boiling water and whisk by hand until well combined. Pour dissolved gelatin mixture into the condensed milk mixture, and whisk util combined. If the mixture is too warm now, leave it on the counter to cool a little, but make sure it doesn't settle. When the mixture cooled a bit, pour it on top of the peach layer. 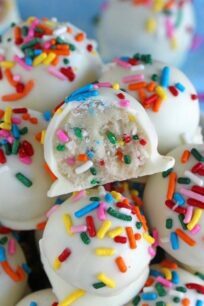 Place in the fridge for 40 minutes, until the creamy milk layer is set. Once its set, start on the Raspberry layer. Raspberry Layer: follow the instructions on the package as they may differ based on the brand you use. Usually you just have to mix the package mixture with cold water. 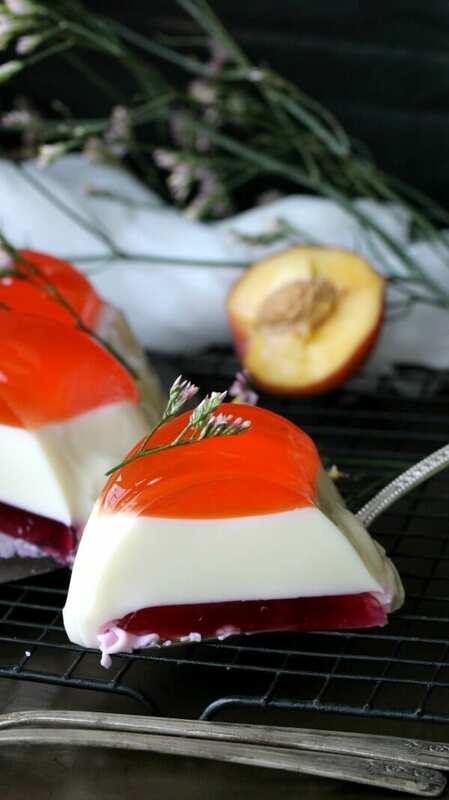 Pour it on top of the creamy milk layer and set in the fridge until jelly is set, 20-30min. To remove cake from the pan, place the cake into a bowl of hot water for a few seconds, cover with the desired serving dish and turn upside down. Place again in the fridge for one hour before serving. If you use a silicone mold you can skip the hot water step as the cake will be very easy to remove. Katalina, Thank you so much for your kind words left on my blog. I truly appreciate it! Your bundt jelly cake looks stunning! Really love the beautiful colour contrast and summer flavours here. This cake is gorgeous, Katalina! I can’t get over how easy this is to make. Sounds so perfect for the summer. What a great dessert! 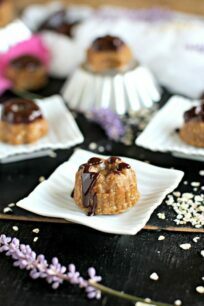 Such an easy and beautiful dessert idea, it looks gorgeous!! Hi Tandy, the surgery went well and he is fine, many thanks! I hope everything went smoothly of your son! This jelly cake is gorgeous! I love sweetened condensed milk and can eat it from the can. I’m dying to try this out! Thanks TAO! OMG me and my husband eat it straight from the can too, its so good, you will love this cake if you are such a fan of condensed milk. On the list of ingredients you list 4 plain knox envelopes, but in the recipe it states mix 2, I want to double check which is correct? Can we use fresh milk to condense milk? Yes, you can, but you will have to add sugar, 1/2 cup I would say, otherwise it wont be sweet, also please keep in mind that it wont be as creamy and rich. Hello, I’ve just discovered your wonderful recipe, and was wondering, what size is your Bundt, as in; how many cups is it? I have own a few size’s, and want to be sure I use the right one. Hi Natassia, thank you for the kind words. I usually use a 9” long x 9” wide x 4.6” deep regular size bundt pan, but made of silicone, as its so much easier to remove desserts, especially the ones made of jelly.